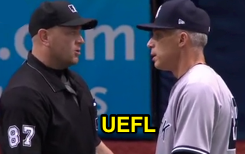 HP Umpire Scott Barry ejected Yankees Pitching Coach Larry Rothschild & Manager Joe Girardi (balls/strikes) in the bottom of the 5th and Rays pitcher Matt Andriese (Throwing At Yankees batter Aaron Judge) in the top of the 6th inning of the Yankees-Rays game. In the 5th, with one out and the two on (R1, R2), Rays batter Evan Longoria walked and batter Logan Morrison took three called balls from Yankees pitcher Giovanny Gallegos before singling on a 3-2 count. Replays indicate that of the seven ball calls eligible for QOC consideration, all seven were properly officiated (7 / 7 = 100% accuracy), with a closest all-else-equal px of -.834 and closest all-else equal pz of 1.635 (sz_bot 1.589 / MOE 1.672), the call was correct. In the 6th, with none out and none on, Judge took a first-pitch fastball from Andriese for a hit-by-pitch. Replays indicate the pitch was located significantly inside and belt-high; it was the third hit batsman of the game (second by TB), warnings had not been issued, the call was irrecusable. At the time of all ejections, the Rays were leading, 9-4. The Rays ultimately won the contest, 9-5. This is Scott Barry (87)'s first, second, third ejection of the 2017 MLB regular season. Scott Barry now has 12 points in the UEFL Standings (2 Previous + 3*[2 MLB] + 2*[2 Correct] = 12). Crew Chief Paul Emmel now has 7 points in Crew Division (4 Previous + 2 Correct + 1 Irrecusable = 7). This is the 42nd, 43rd, 44th ejection report of 2017. This is the 23rd Manager ejection of 2017. This is the 16th player ejection of 2017. Prior to ejection, Andriese's line was 5.0 IP, 5 ER, 5 SO. This is New York-AL's 3/4th ejection of 2017, T-1st in the AL East (NYY, TB, TOR 4; BAL 3; BOS 2). This is Tampa Bay's 4th ejection of 2017, T-1st in the AL East (NYY, TB, TOR 4; BAL 3; BOS 2). This is Joe Girardi's 2nd ejection of 2017, 1st since May 3 (Bill Welke; QOC = N [Balls/Strikes]). This is Larry Rothschild's 1st ejection since September 26, 2016 (Todd Tichenor; QOC = U [USC-NEC]). This is Matt Andriese's first career MLB ejection. Wrap: New York Yankees vs. Tampa Bay Rays, 5/20/17 | Videos via "Read More"